African Union Peace and Security Architecture: What’s the Story? ECDPM’s visual story and background note on the African Union Peace and Security Architecture (APSA), highlights our work on peacebuilding, conflict prevention and conflict monitoring in relation to the APSA. You will find an overview of some of the main challenges and successes of the APSA and the interaction between the African Union and Regional Economic Communities, and its main international partners, on issues of conflict management, prevention, governance and peace on the continent. To what extent can commercial and development agendas be aligned? The two policy areas – economic diplomacy and private sector engagement for development – seem to come together in North Africa, writes ECDPM’s Sebastian Große-Puppendahl in his latest blog. An example is the EU’s EuroMed Invest, where generally commercial and development objectives are becoming increasingly aligned. The reality suggest that while institutions give quite different mandates, there can be more cross-learning between instruments and policies. For regions with complex issues, such as North Africa, to benefit, this calls for interdisciplinary thinking and acting. Even communal peace accords in the Sahel remain fragile and deeply embedded within burgeoning trafficking economies. The European Council on Foreign Relations argues that smuggling remains too complex a phenomenon to be dealt with as just a security problem. Securitising migration will do nothing to stem the flow of economic migrants or political refugees, but instead push human smuggling further underground. Europe needs a more comprehensive approach to immigration that includes providing increased safe and legal channels for those who want to work in Europe while also helping create economic opportunities in North Africa, the Sahel, and West Africa, they say. Discussions in the ACP and the EU about the future of the ACP-EU Partnership Agreement after 2020 started last spring to prepare for formal positions and negotiations next year. In May and June 2015, Tina Tindemans and Dirk Brems interviewed 18 EU Member State representatives from the EU Council’s ACP Working Party on their preliminary positions on the future of the ACP-EU Partnership Agreement after 2020. Member States with strong bilateral relations with ACP countries said no drastic change is required. Other EU countries consider the current agreement not fit-for-purpose. The newest EU Member States have no strong bilateral interests. 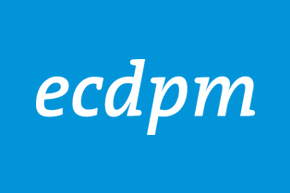 These authors are external and their views do not represent those of ECDPM.